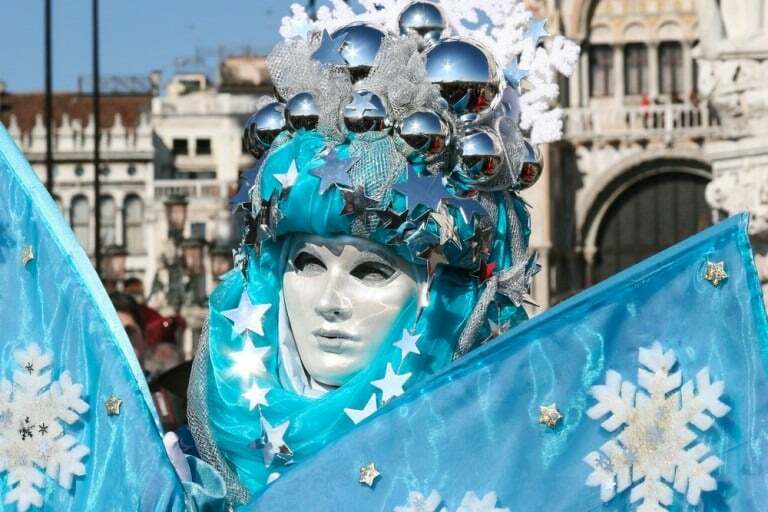 Venice’s world-famous Carnival (or“Carnevale”) is one of the biggest celebrations in Italy! In the past, the Carnevale was much more than a masked festival – the citizens of Venice spent the few weeks enjoying the hedonistic pleasures and lavish feasts that were characteristic of the Carnival. Palaces opened their courtyards to host grand celebrations – there was music and dancing all day and night in the alleyways, small squares and even on the water. The long-standing tradition of wearing masks also made it possible to hide the differences of status and class amongst the Venetian people. The serious excesses forced the Venetian Republic to issue a series of decrees to limit the use of masks and costumes in Venice. With the fall of the Venetian Republic in 1797, Venice Carnival was banned. The fall of the Republic at the hands of Napoleon marked the end of the long independence of Venice and the abolition of the many traditions of the Venetian Carnival for about two centuries. Only from 1967 the first parties were reorganized with parades of masks and costumes, masked balls and music. Nowadays in Venice, they schedule many feasts, parades and the famous Flight of the Angel, when a girl in a stunning angel costume flies along a rope from the San Marco bell tower to the middle of the Square. The flight is held at noon, and is attended by thousands of locals and tourists alike. Over the last few days of the Carnival, a big wooden stage hosts the awards ceremony of the best masked costume, which is elected after several parades that take place during the central days of the festival. This stage also hosts different plays throughout Carnival, where traditional masked characters from the Commedia dell’Arte like Harlquin (Arlecchino ) entertain the crowds. The Carnival lasts from Epiphany (Epifania) on the 6th of January until Shrove Tuesday (Martedi` grasso) on the 13th of February. On the 14th, Ash Wedneday (Mercoledi` delle ceneri) marks the beginning of Lent and the end of the celebrations. The typical desserts of Venice during the Carnival are Galani, Frittelle (with cream, zabaione, raisins and pine nuts) and Castagnole. 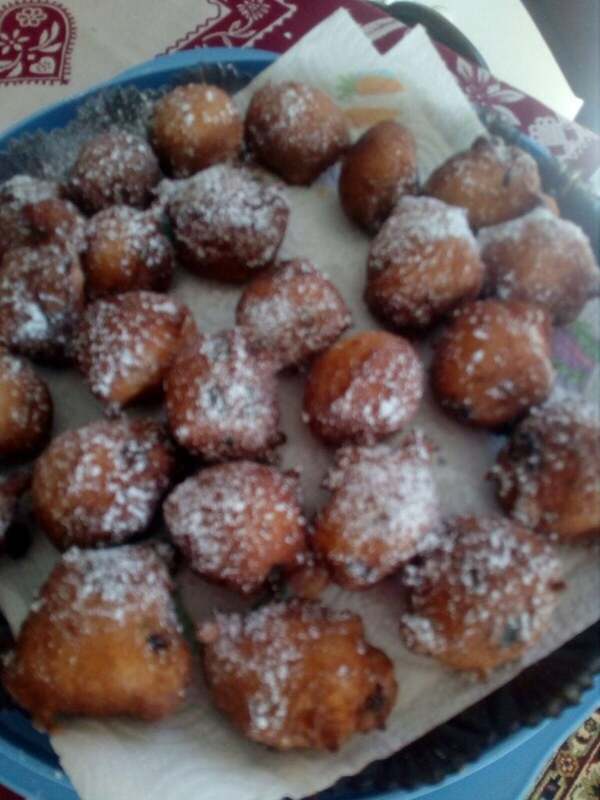 Why not try making your own Frittelle this Carnival season with our Flavours recipe! Our Flavours frittelle, made in the office! Beat the eggs, sugar, ricotta, flour and baking powder together, combining well until you have formed a smooth mixture. Add in the raisins, salt orange and lemon zest and juice and the grappa, mixing until the raisins are evenly spread throughout the mixture. Heat the peanut oil in a saucepan on a medium heat, until, when a toothpick is thrown in, the oil boils around it. Take a tablespoonful of the mixture and carefully lower it into the oil. For best results, fry around 4 or 5 frittelle at the same time to keep the temperature of the oil uniform. Fry the frittelle for a few minutes until a golden brown, then take out of the oil, placing on kitchen paper to drain the excess oil. Continue frying the frittelle in batches, until you have used all the mixture. The frittelle are best served immediately, sprinkled lightly with sugar.